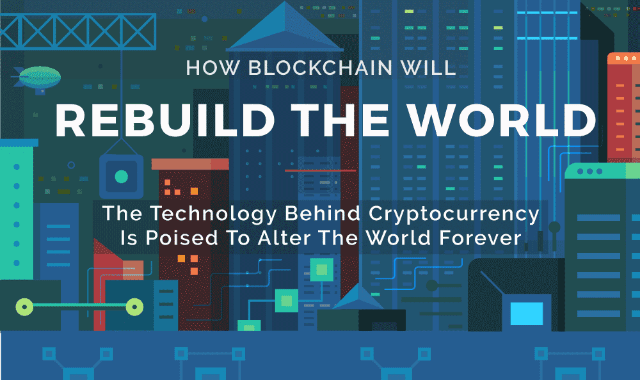 How Blockchain will Rebuild the World #Infographic ~ Visualistan '+g+"
How is blockchain going to change the world? It already is in a lot of ways! One of the biggest potential applications for the blockchain is in land titles. In Sweden and all over the continent of Africa there is talk of putting land titles on the blockchain, but in Brazil a pilot program will be starting soon to make it happen. In Brazil corrupt government officials have been known to change government records to give themselves ownership of lands, particularly along the coast, which adds to instability in the country. Blockchain land titles would be tamper evident, which would in turn lead to greater security for the country. There are multiple proposals for blockchain applications across sectors from healthcare to education to voting. It is said that blockchain is the solution looking for a problem, and it is not likely every application being tested will work. Learn more about blockchain applications that might change the world from this infographic!